People with type 2 diabetes aren't primarily insulin-dependant. Sometimes a base therapy with weight reduction and dieting or by using oral drugs could be sufficient. 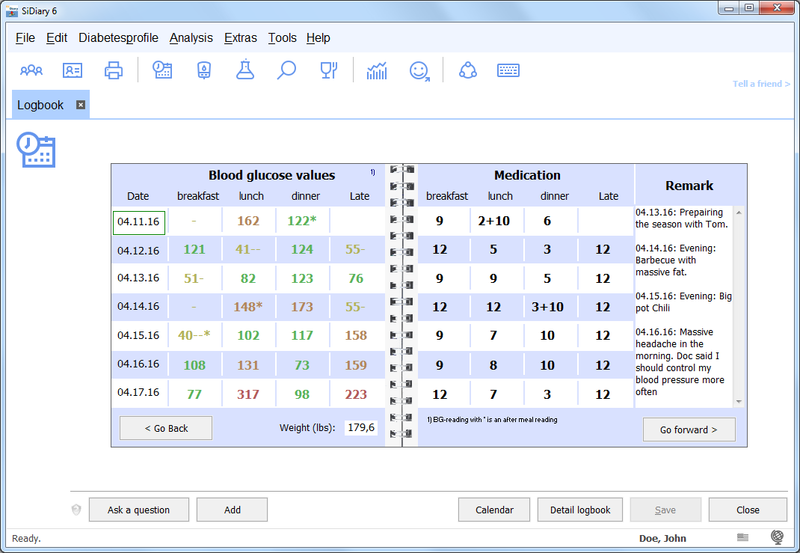 Few diabetes software are providing the possibility to track pills as well as insulin together as a combination. With SiDiary you can track information, when you have taken your pills, how much of them and also when you took your insulin shots. With this notes you and your doctor will get the neccessary information to optimize your therapy. Best of all: SiDiary will grow with your needs! This means that for changes of your therapy you don't need to change your log book. You can still track your data with SiDiary, if you are using a therapy with orals supported by a long acting insulin or if you just need insulin shots of a fast acting insulin to cover your carb intake: SiDiary will help you to track all of these things. Additionally SiDiary can help you remember the next bg level reading or the next pill intake because it comes with an integrated reminder module. Especially people with type 2 diabetes are profiting from steady exercises. Of course you can track those exercises with SiDiary along with the duration and the strength of the activity. Your log book does now contain valuable information because you can see how your body will react on your exercises and how the general blood glucose average will become better with regular exercises (because of an improved insulin sensitivity). Another parameter that have to be watched by type 2 is blood pressure: You can track your blood pressure in a separate grid row and although the base pill configuration of your diabetes profile targets your diabetes orals primarily, you can enter also pills against hypertension and track them on the daily sheets! With a log book like SiDiary you can keep your records and show your doctor all of your efforts for your therapy and hopefully the improvements coming with the efforts. Especially for prescription of test stripes it can be useful to show your doctor the real number of stripes you have taken i.e. on a quarterly basis. Take your data with a printed log to your doctor and discuss with him all situations which could be potentially optimized.